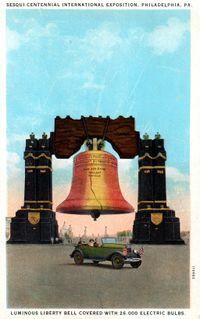 After years of bickering among Philadelphians, the Sesquicentennial opened in 1926 and welcomed visitors to South Philadelphia with a Liberty Bell lit by 26,000 electric bulbs. In 1926, Philadelphia hosted the Sesquicentennial International Exposition, a world’s fair, to commemorate the one hundred and fiftieth anniversary of the signing of the Declaration of Independence. Although it opened to great fanfare, the exposition failed to attract enough visitors to cover its costs. The fair organization went into receivership in 1927 and its assets were sold at auction. The idea to commemorate the signing of the Declaration of Independence by holding a world’s fair originated in 1916 with John Wanamaker (1838-1922), owner of Wanamaker’s department stores and lone survivor of the 1876 Centennial Exposition’s Finance Committee, who called upon Philadelphia to host an industrial and commercial exposition that would fittingly mark the birth of the United States. World War I temporarily derailed planning, but in 1920, Mayor J. Hampton Moore (1864-1950) and a group of leading citizens took up the effort; they incorporated the Sesquicentennial Exhibition Association (SCEA) in 1921. Note: The above descriptive information came from Philadelphia Encyclopedia. This page was last edited on 28 March 2019, at 15:04.